Unemployment has dipped in the first quarter of the year, with fewer layoffs in a tight labour market. The overall rate fell to 1.8 per cent in March, down from 1.9 last December. Among citizens, the unemployment rate was at its lowest in nearly eight years, falling to 2.6 per cent. There was a similar drop among residents. Around 3,624,200 people had jobs here in March, up 2.9 per cent from a year ago. But preliminary figures released by the Manpower Ministry (MOM) yesterday also showed that job growth was at its weakest since the second quarter of 2009. Just 300 jobs were added in the first three months of this year, which left some economists surprised and worried while others believed this was a one-off as firms take stock in the first quarter. The 300 figure is just 1 per cent of the 28,300 jobs added in the first quarter of last year, and even less when compared to the 40,700 jobs created between October and December. 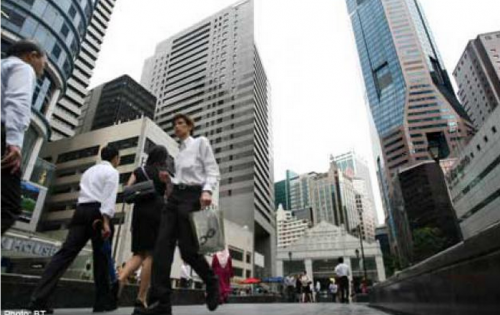 In recent years, Singapore has averaged around 30,000 new jobs each quarter. "Even if 3,000 jobs were added, it would have been on the very, very low end," said UOB economist Francis Tan of the latest figure. MOM explained that slower job growth "is not uncommon" in the first quarter, as seasonal workers hired for the festive season leave. The slowdown was bigger this year because of a "large decline in the retail, F&B and cleaning industries", it added. Employment in the services sector grew by 9,300, but it was still a 60 per cent drop from the 24,900 jobs added in the same period a year ago. Manufacturing lost 6,400 jobs amid weakening exports. Ms Femke Hellemons, country manager for Adecco Singapore, said that the sector is still going through restructuring to rely less on labour and focus more on productivity and high-end products. Jobs in the construction sector also shrank by 2,800, the first quarterly decline since 2004. This might be due to the continued impact of foreign labour curbs, said economists. Overall, a shortage of both foreign and local labour partly explains the huge fall in job growth, said economists. Companies have vacancies but cannot fill them, said DBS economist Irvin Seah. In a Facebook post, Manpower Minister Tan Chuan-Jin also said the figures were "early signs of the slowing growth of local labour force", which means that firms must do with fewer workers. But Singapore Business Federation chief operating officer Victor Tay hopes more information will be released to explain the numbers. "Is it supply issues of a shortage of local manpower, or that our economic engine has changed fundamentally in job creation? We need more information on how much of it was job losses, firms hiring less, or firms leaving (these shores)," he said. Barclays economist Leong Wai Ho thinks the plunge is more likely to be a one-off, and would only worry if the number continued to be so low in the next quarter. "I don't think there's a need to be too concerned because the economy is at full employment at the moment," he said. Despite the drop in unemployment and redundancies, Manpower Minister Tan struck a note of caution. "We will see fluctuations as our economy restructures and it can be painful. You will have redundancies increasing from time to time. "But when companies stay competitive and viable, we continue to generate good opportunities for our Singaporeans." Minister for Social and Family Development Chan Chun Sing, who becomes head of the labour movement tomorrow, said the focus should be on long-term trends rather than quarterly figures. Speaking to reporters on the sidelines of a National Trades Union Congress event yesterday, he added: "The longer-term trends that NTUC is monitoring closely is not just the number of jobs that are being created, but also the quality of jobs."